Interested in spreading some peace? So are we. That's why we created the Peace On Earth box of cookies. 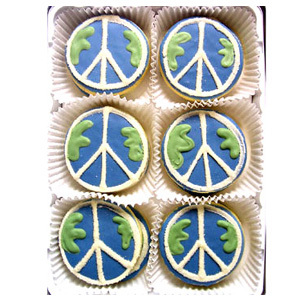 These gourmet, certified organic cookies are hand-decorated as the planet Earth adorned with a peace symbol. Send a gift box to your socially concerned family members, friends, or for your own family. What better way to send a message of peace than through a cookie? Order our Peace On Earth cookies today. Available in vanilla or chocolate.